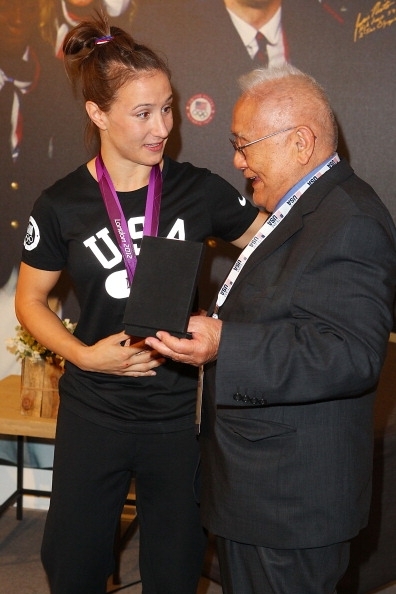 SJSU judoka Marti Malloy shares her medal with Coach Yosh Uchida (photo by Joe Scarnici/Getty Images for the USOC). With judo legend and fellow Spartan Yoshihiro Uchida watching from the stands, SJSU judoka Marti Malloy persevered through a tough series of matches to win a bronze medal at the 2012 Olympics in London. 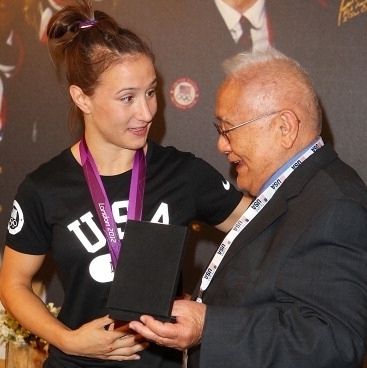 A recent advertising graduate, Malloy came to San Jose from her native Oak Harbor, Wash., to train under Uchida, who has spent a lifetime cultivating judo into an Olympic sport. In an interview with NBC Bay Area’s Raj Mathai, Malloy said “When I first got to San Jose, I was accepted into that program like I had been there my whole life, and ever since then, they’ve been my family. Meanwhile, Malloy’s fans here in San Jose held a viewing party to watch her compete, an event also captured by NBC Bay Area. In a front page story in the San Jose Mercury News, columnist Mark Purdy describes how hard Malloy worked in London to bring home the bronze. Malloy also appeared on the Today show, where she was recognized for being the second woman in U.S. Olympic history to medal in judo.